From my Indian class this dish is from the South which means there is some serious heat. I love this as a side dish for lamb, chicken or a simple vegetable curry. These are very spicy, always pair with rice and or a yogurt dish such as Raita to temper the heat. The idea of a mango lassi with this is quite appealing. If you would like to cut down on the heat use less chilies and halve the red pepper flakes. In a large skillet over high heat warm the oil. Add the seeds and cover the pan, when the seeds stop popping turn off the heat and uncover the pan. Add the garlic and kari leaves and cook until golden about 30 seconds. Stir in the curry powder, cumin and red pepper flakes. Add the tomato wedges and cook 3 minutes without stirring. 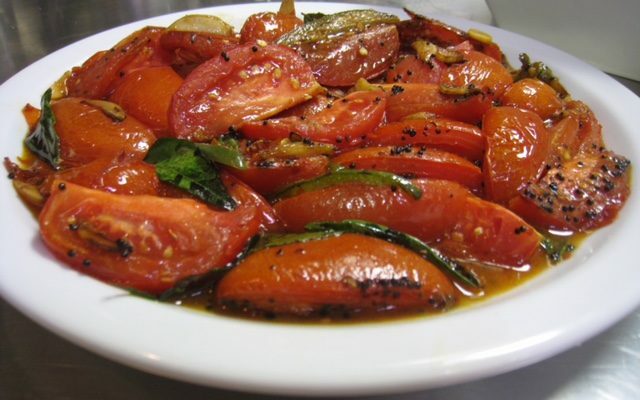 Carefully mix the tomatoes and cook until very soft about 6 minutes. Add the chilies, salt and lime juice and cover until ready to serve. Serve hot or cold and this can be pureed for a great sauce for chicken, fish or meat.